With over 100 patented technologies that provide a solid foundation on which to continuously revolutionize the way multimedia is experienced, CyberLink’s visionary outlook has allowed the company to grow rapidly and create cutting-edge solutions. This ultimately led to a record-breaking IPO on the Taiwan Over the Counter Exchange (OTC: 5203) in 2000. CyberLink is currently listed on the Taiwan Stock Exchange (ticker symbol: 5203.TW). To this day, CyberLink’s original founders remain with the company, displaying the same passion in directing and managing day-to-day operations, and leading the team toward continued technological innovation and key product strategies. CyberLink's worldwide headquarters are located in Taipei, Taiwan, with regional operations offices in North America, Japan, Europe and Asia-Pacific. The company has 700 employees worldwide, with more than 500 engineers in product design and development. CyberLink Corp. is the world’s leading multimedia software company and pioneer in video and audio technologies on PCs and portable devices including tablets and smartphones. 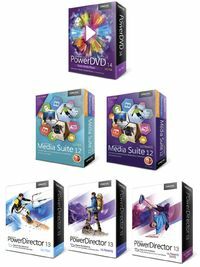 CyberLink’s cutting-edge products such as PowerDVD, PowerDirector and Media Suite are among the world’s best-selling digital multimedia applications. Renowned for ease-of-use, CyberLink products have garnered the prestigious PC Magazine Editors' Choice Award multiple times. Blu-ray, 3D and HD Support: CyberLink’s complete entertainment and creativity solutions offer a broad range of tools for enjoying Blu-ray movies at optimal quality, creating HD content and burning digital media onto Blu-ray discs. Includes extensive 3D support for viewing and creation. Media Enhancement Technologies: CyberLink’s TrueTheater advanced video and audio technology elevates the multimedia experience on PCs. Whether premium or user-generated content, CyberLink brings out the best in video quality with breakthrough technologies. Total 360-video Solutions: CyberLink is the first company to bring 360 video playback and editing software tailored to the needs and budget of the average consumer. PowerDVD 16 allows playback of 360-degree videos with quality enhancements that create a truly immersive experience. For video creators PowerDirector 15 is the complete 360-degree VR solution to edit and produce footage shot on the latest 360 cameras. Media Processing Acceleration: CyberLink leverages the full power of Intel’s new second generation Core microprocessor to create seamless software solutions for today’s most computing intensive applications, such as 3D Blu-ray playback, converting 2D Blu-ray to 3D on the fly, 4K Ultra HD video rendering and processing, transcoding content onto smart devices and more. Entertainment Everywhere: Whether at home or on-the-go, CyberLink’s software lets users enjoy their content anywhere and on any device – iPhone, iPad, Android or Windows 8 devices. Digital Media Apps for Smart Devices, Includes DLNA Support: CyberLink offers a line of apps to sync, enjoy and create digital content. These standalone apps are designed for smart devices or as an extension from the desktop application. Push your content to and from your PC, smart devices and your home DLNA TV. Director Suite is a total solution for media creation. It includes four award-winning applications - PowerDirector, ColorDirector, AudioDirector and PhotoDirector, offering the most complete, video and photo editing solution for advanced enthusiasts. With round-trip-editing support, the four applications in Director Suite work seamlessly with each other, providing a smooth and highly efficient post-production environment. Media Suite has something for everyone in the family, and every occasion. Whether you're editing wedding photos, creating a highlight video of your last holiday, or simply kicking back and watching the latest movies in cinematic quality, Media Suite has you covered. With 15 multi-award winning products packed into one killer software suite, you won't find better value-for-money or a more convenient way to handle all your digital media needs. Have you ever wondered why it seems be so difficult to move videos, photos and music from your PC to your mobile phones, tablets and media players? 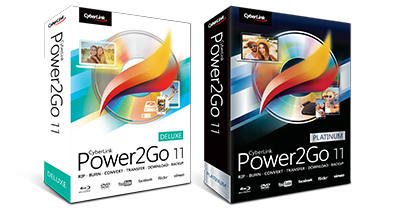 Not only the most trusted burning software by leading PC brands, Power2Go stands ahead of the competition with more patented technology and the widest range of disc and mobile formats. With its famously easy-to-use interface coupled with new enhancements that provide better-than-original quality when transferring movies, Power2Go remains the leader in burning, backup and conversion software. With over 300 million copies sold, PowerDVD is the world's number one movie and media player, serving up the highest quality, most immersive media entertainment experience available on PC. PowerDVD now brings this award-winning experience to your big-screen TV, with a stunning new TV Mode that lets you recreate the atmosphere of cinema in your own home. CyberLink YouCam delivers the functionality of a complete live video studio, to take full advantage of your webcam. It comes with face beautifier tools, over 200 fun effects for video chats and recordings, and a full set of capture tools. Additionally, it offers simple-to-use and efficient security tools, such as surveillance and face login. Transform your virtual presence with YouCam.